people together to share delicious food. and pick it up at your favorite restaurant, up to 75% less. There is a problem that many restaurants, cafes and/or shops produce fresh food and try to sell it during a business day; but, usually, they have an amount of it left. As a result, they should utilize food in accordance with the local regulations, spending money for that. It yields losses for businesses and pollutes the environment. The deals are updated daily and Customers always order fresh food at lower costs. Axon has developed and launched iOS and Android application for Retailers and Consumers. The application allows Retailers publish and manage their deals. 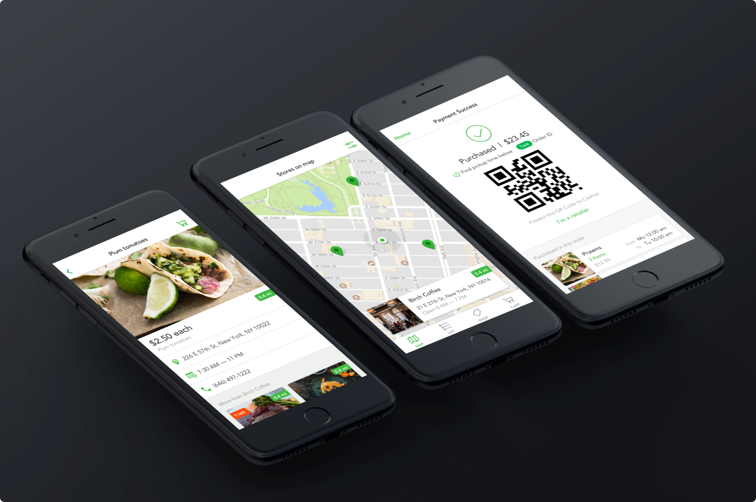 For Customers, the application provides functionality to find deals on the map around their location, buy food and pick up at the store. The deals are updated daily. The Customer's order always fresh food at a lower cost. The mobile has built-in Google Maps which make it simpler to create an optimal route to it and pick up the food. To fulfill the business requirements we have delivered iOS and Android applications. This is a client-server type of application and we have used React Native for client's side and NodeJS Hapi Framework for backend. We used different online services to make the development cheap and fast on the initial stage: Nexmo makes automated calls to retailers on each order processing: Stripe handles payment process, Google provides geo location services, Heroku handles all devops operations, Sendgrid sends email confirmations on user registration, mLab provides MongoDB database infrastructure, Segment tracks and aggregate events on the backend, Cloudinary provides images store and transformation tools.